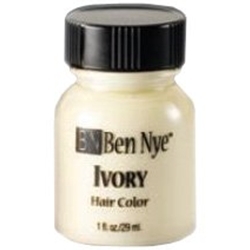 Ben Nye's Ivory Hair Color is for adding age color to darker hair. By adding a little golden yellow to their Snow White formula, they designed a shade that effectively eliminates the blue cast. Available in 1 oz, 2 oz., 8 oz., and 16 oz. size.